Recruiting and training the next generation of talent to develop new ideas for the future growth of the business have been key elements of the success story at one of the UK’s leading independent lubricants firms. 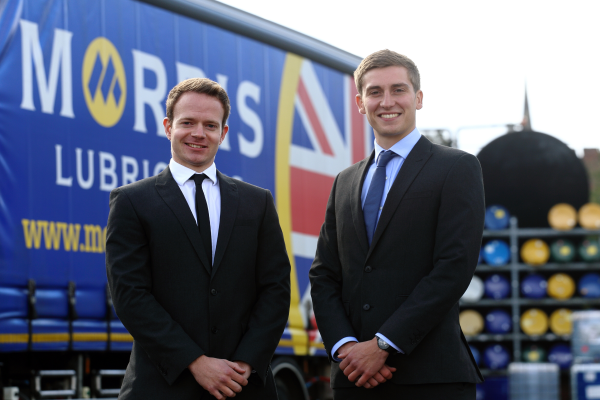 Shrewsbury-based Morris Lubricants celebrates 150 years in business in 2019 and this longevity could not have been achieved without harnessing and nurturing the talent and energy of its loyal workforce, which today numbers 250. For five generations the company has focused on quality, innovation, flexibility and trust across the entire business, which was founded by entrepreneur James Kent Morris in 1869. Staff training and development have been crucial to keep the company up to speed in a fast-moving industry where a competitive edge and first class customer service are paramount. Company chairman Andrew Goddard, a fifth-generation descendant of James Kent Morris, recognises that his employees are the backbone of the business and their security and fulfilment at work are essential. “We try to go the extra mile to ensure that we offer a supportive and enriching workplace,” he said. “As a result, we have been rewarded by a loyal staff with long service to the company and a very low turnover rate. “Training, development and providing opportunities for talented young people to progress within the company are vitally important to the business. With an eye on the future, the company launched a graduate recruitment programme in 2015. Kyle Gleeson, 30, from Tamworth and Owen Lloyd, 25, from Church Stretton, were the first graduates to join the programme and are now holding down key jobs within the company. Both have spent time working in departments across the company to gain a greater understanding of how the business operates in home and international markets. Kyle, an international business studies honours graduate of Sheffield Hallam University, is now commercial manager in the export department. He achieved the United Kingdom Lubricants Association (UKLA) Certificate of Lubricant Competence with a distinction and an Institute of Leadership and Management (ILM) qualification. During his time in the technical department, he was heavily involved in redeveloping the company’s unique “What Oil Do I Need?” innovation. This database allows Morris Lubricants to make an oil recommendation remotely online based on details including vehicle registration, make or model. He was then transferred to the production department where he supported the introduction of a new computer system and liaised with customers throughout the process. He was also heavily involved in a new business venture in India, visiting Mumbai to meet staff, customers and suppliers to gain a better understanding of how the company and market operate. Owen, an agricultural engineering graduate of Harper Adams University, is now a buyer in the purchasing department. With the UKLA Certificate of Lubricant Competence and an ILM qualification under his belt, he is now seeking to become a Member of the Chartered Institute of Procurement and Supply, an internationally recognised award which represents the global standard within the profession for a procurement and supply professional. Mr Goddard says talented young employees, like Kyle and Owen, represent the company’s future. “For the company to continue to develop and thrive in the future, it’s essential that we recruit talented young graduates who can make a telling contribution to the business,” he added.